The most important meal of the day is…. Breakfast! But if you’re like me and you’re not a morning person, it can be hard to get a decent meal in for breakfast. Since I started taking early morning classes, I found out that a full stomach is a happy stomach. An empty stomach can sometimes be distracting during school. For one, a loud growling stomach in a quiet classroom can cause you to be distracted especially during a test and second, it is annoying. 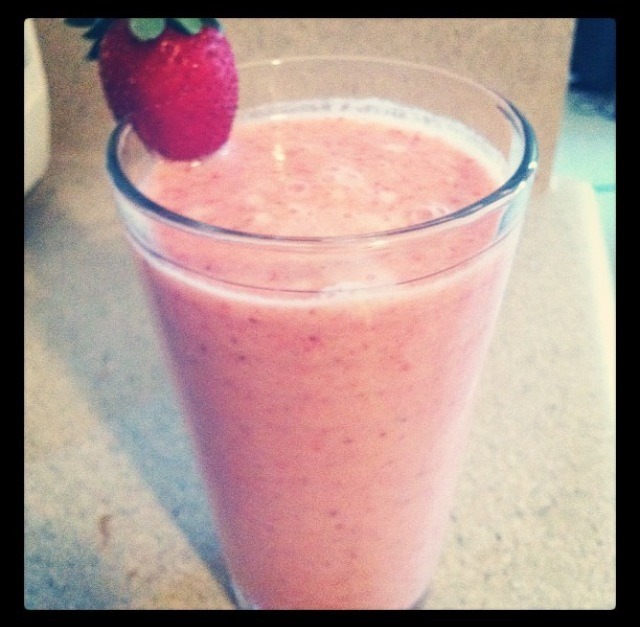 So I thought I’d share one of my morning smoothie recipe with you. Whether you’re headed to school, work, or just up early in the morning, this simple, quick, and easy recipe is a great way to start your day. Ingredients can also be prepared the night before if you want to get just a little more minutes of sleep in. *Please note that if you freeze your fresh fruits the night before, then you wouldn’t need the ice. To save time in the morning, you can prepare the strawberries and bananas the night before and freeze them overnight. In the morning, combine all your ingredients together in a blender. If you’re using ice in your smoothie, put them in the blender first and then the rest of the ingredients on top. Blend until all ingredients are smooth and combined. Pour your smoothie into your cup and drink it on your way to a happy stomach. Enjoy!